The three stage lift which leaves from Malga Cipela is approximately 5 minutes drive from the house or a couple of stops on the ski bus which shuttles up and down the valley. Its a well organised cable car and is mainly to be recommended to those comfortable with more advanced skiing. 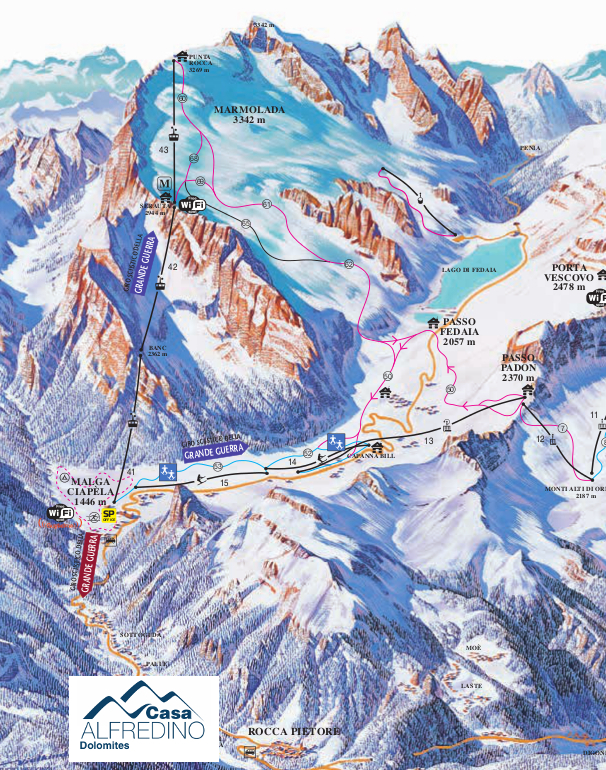 Although the run coming down from Punta Serauta is given a red grading, it’s a narrow piste and can get quite chopped up as this is an obvious goal for the holiday maker – a feather in the cap for skiing the top of the Dolomites. Its understandable as the views afforded not only from the summit, but also the three lift stations are truely breathtaking, especially leaving the top station as you descend to the snow above the enormous 800m high South Face of the mountain. Where this range really excels is for those who want to find great off piste skiing as once you leave the red markers behind, you will find excellent snow, kept fresh by the ice beneath and often a lack of tracks as Italians mostly stick to the runs. Once you realise this it becomes an enormous playground with fairly moderate offpiste skiing, never too steep and with a lack of difficult terrain to negotiate. Indeed you can also cross the glacier to the opposite end of Lago Fedaia to ski the single lift runs at that end of the mountain- just check they’re open before you do so! The normal and very long run drops you back to Malga Cipela past several eateries and the lift to Passo Padon, the key to the Arraba range and the Sellaronda. The run from Passo Padon in itself is a nice run, red and well groomed although as its south facing can get melted by the sun in the afternoon and late in the season – its a throughly enjoyable return from Arraba and fairly steady, neither narrow nor desperately steep. Again, those looking for a nifty swoop down the side country will find most agreeable terrain on Skiers left… All these lead back to the base station along some blue runs which are served by button lifts. These are great for taking beginners on as they are wide and shallow without flatspots and and make a great first few runs for young guns, especially as they are quiet, served by button lifts and usually have good visibility because they are lined with trees which help with contrast! An opportunity not to be missed is the run through the Serrai di Sottoguda. This narrow, deep gorge is strictly speaking offpiste. However it is so frequently run by skiers and boarders that it is nearly always virtually a groomed piste. Its narrow with no safety barriers and several bridges so please take care, but the views of the gorge, of climbers scaling the incredible ice cascades and the impressive rock architecture really are breathtaking. It ends when you reach the village where you must walk down to catch the bus back to the house, but the 5 minute trip can be easily split with a trip to La Tirolese, our favourite pizzeria! Last but not least, if you fancy trying your hand a something a little different, there are some quite extensive cross-country runs – grab yourself some of those skinny sticks from the De Grandi hire shop at Malga Ciapela and you’ll find some really pleasant skiing in the woods to the south of Malga Cipela which lead up to a small “agroturismo” where you can sample the local cheeses and meats in a really beautiful and secluded spot. There are three circuits, a blue, a red and a black and they all leave from the same spot.